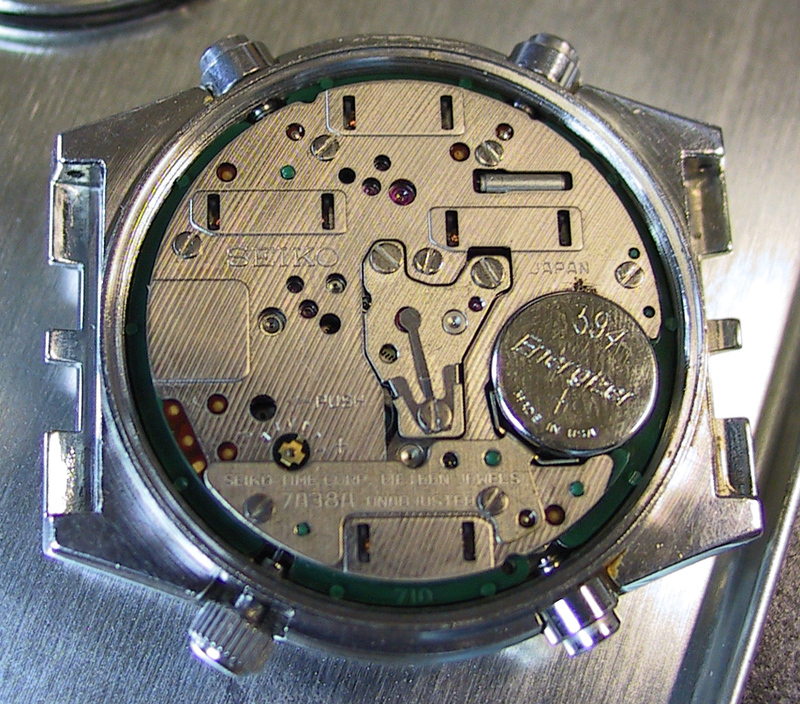 The 7Axx series had 15 jewels (base the 7a38 had 17 and is the day date model) it has four stepper motors and all metal gears. 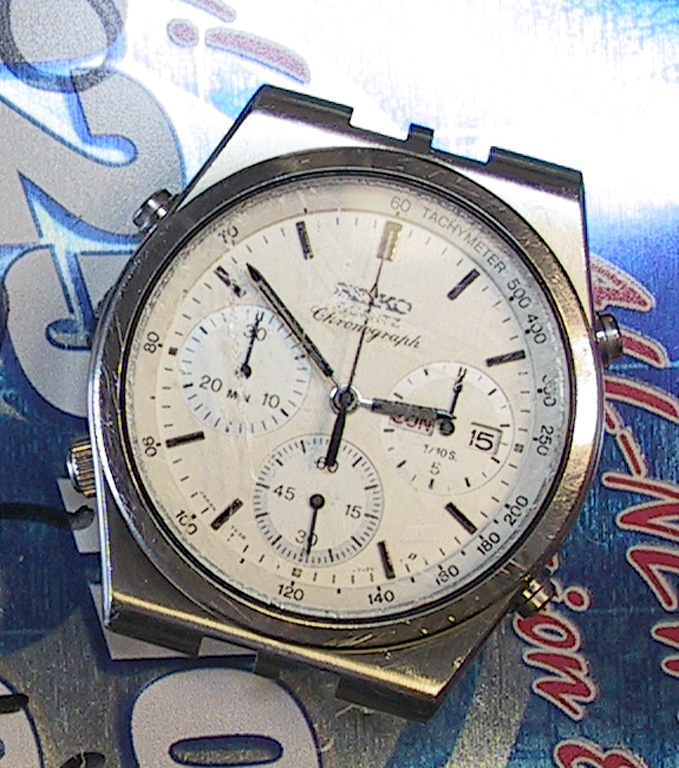 This was the worlds first analog quartz chrono. It went into production in the early 80s and out of production before 1990. Its distinctive feature is the crown at 8 and calibration "pot" on the movement for calibrating the quartz movement, a feature not found on new quartz movements. 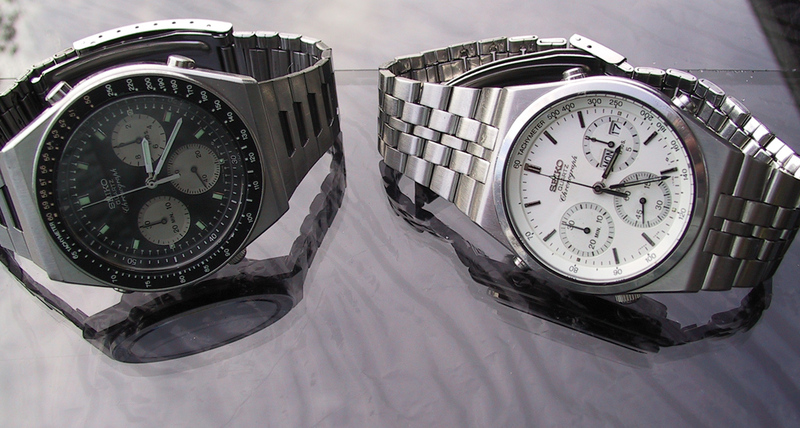 The 7axx series movements remain one of the best Quartz Chronographs ever mass produced. 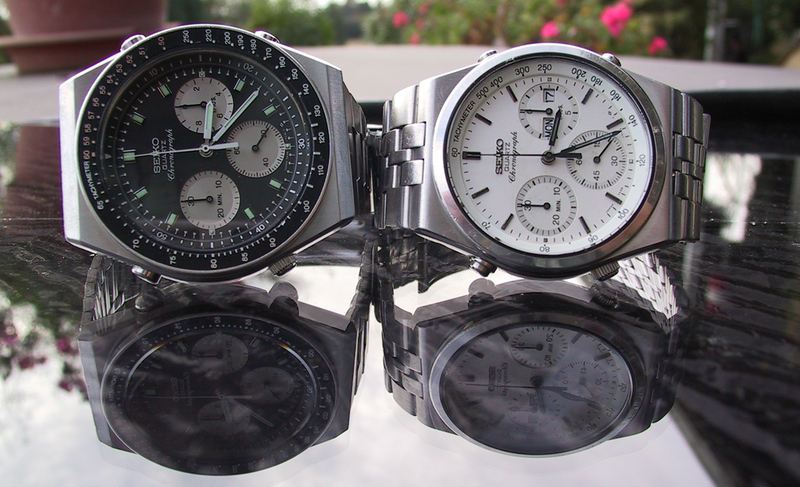 Both of the chronographs shown here have been rebuilt I have new Seiko glass for both of them and new seals too but I'm a couple seals short of being able to finish both of them and I have been too lazy to order the rest of the seals. You can also see the remains of a donor movement in the picture on the right... oh ya, there is a good use for those metal AOL tins! I recommend you read both versions, there is no such thing as too much information you can always ignore what you don't want to hear! Pay attention to the tools that are visible in the photos or are mentioned as required. If the instructions with the photos just confuse you just look at the photos and use your head, your going to press out the old crystal and press in a new one. Just be gentle, take your time, and think about what your doing. Even experienced people will occasionally break a crystal trying to press it in or removing it. Its not that hard though, once you develop a "feel for it" its as easy as changing a light bulb .. ok a really small light bulb. Read the notes at the bottom of the page too! 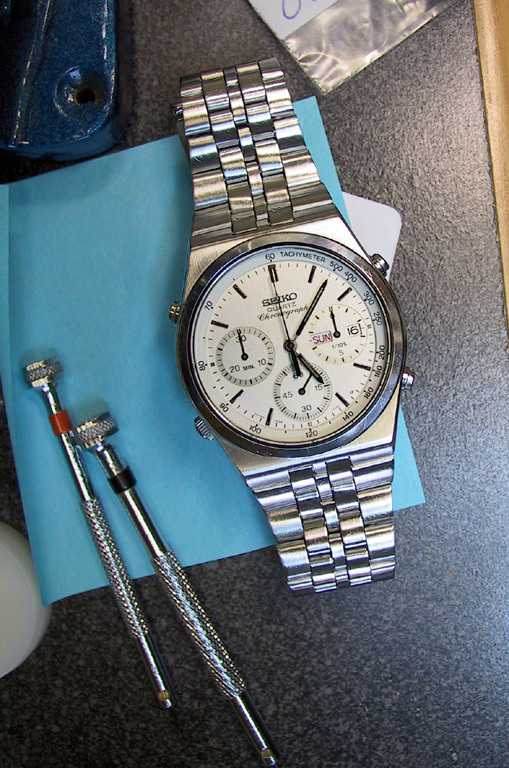 I used a quartz chrono for the tutorial but the procedure is the same for any press in type crystal. If your watch has a rotating bezel its a good idea to remove it first so you have a firm true surface to work with on the front of the watch. 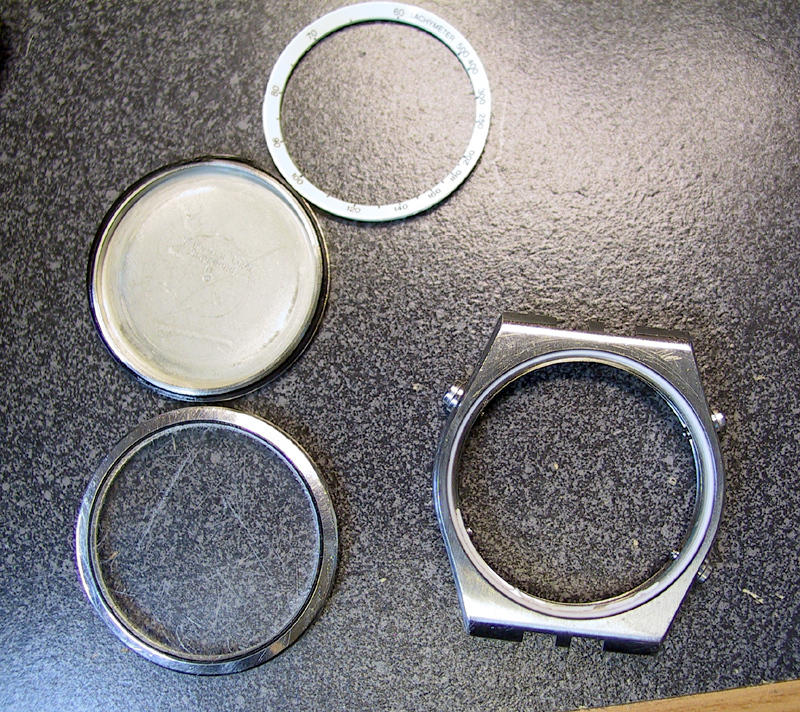 Most rotating bezels just pry off, you will need a pocket knife to do this. 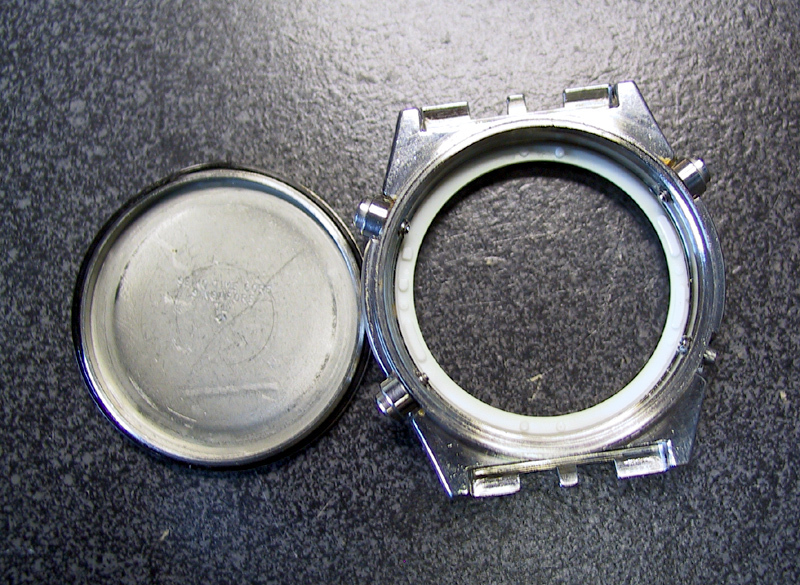 The same rules apply for removing the bezel, just be gentle, take your time, and think about what your doing. If your not careful you will scratch, ding, or amputate something you will likely want back! here you can see this crystal is toast! and safely tucked away in a nice metal AOL cd tin. THEY ARE GOOD FOR SOMETHING! 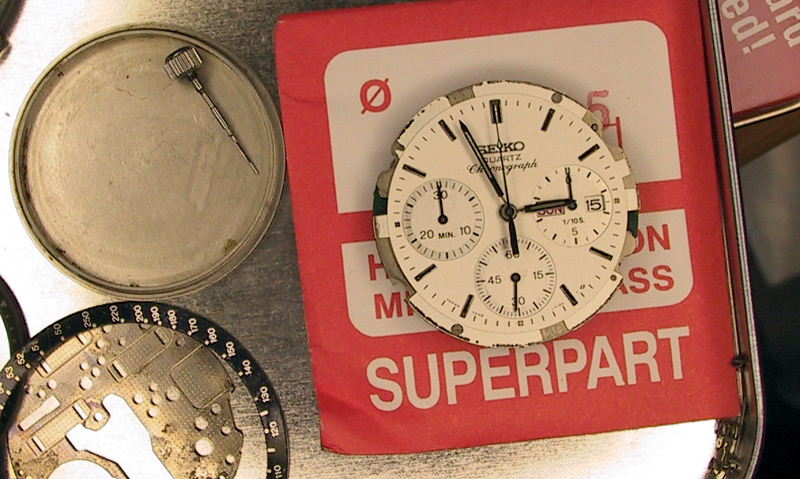 most people won't need to remove the bezel too but this watch is a project that needs a bit of refinishing too so I chose to remove the bezel to polish it up some and the same goes for the case. 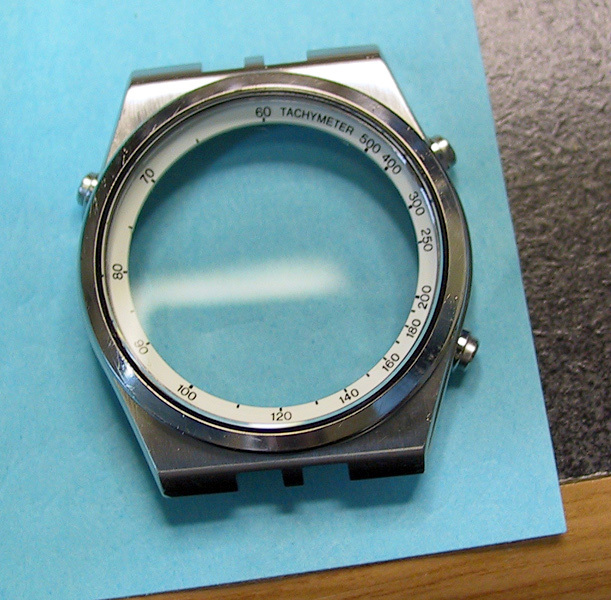 You can see there is a white nylong gasket still in the case that seals the bezel when its installed. Don't loose This. If you haven't ordered one you will not find something else to use in its place! And no you can't "just glue it"
If your just going to replace the crystal you will be sizing up the bezel still on the watch! 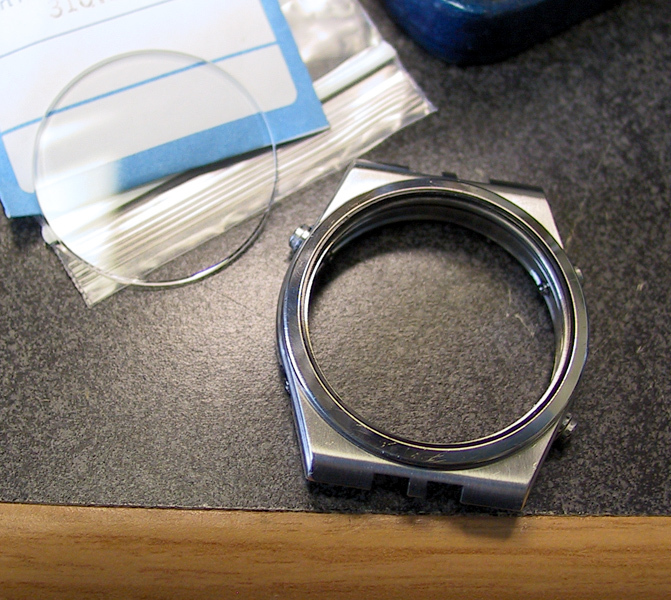 with a "pop" the crystal is free, NOTICE the black nylon gasket still in the bezel! we're ready to press the new crystal in! measure both crystals (if the old one survived) and make sure they are the same size. Its a tension fit so you should'nt be able to just pace the crystal into the front of the watch, thats why we have a press. If its that loose there is something wrong .. is the gasket laying on the floor somewhere? is the reverse of poping it out. I like to start it by hand a tiny bit just to make sure that I have the crystal inside the gasket all the way around I have pressed crystals in and ruined the gasket cuz the gasket got caught under the crystal instead of staying around it. 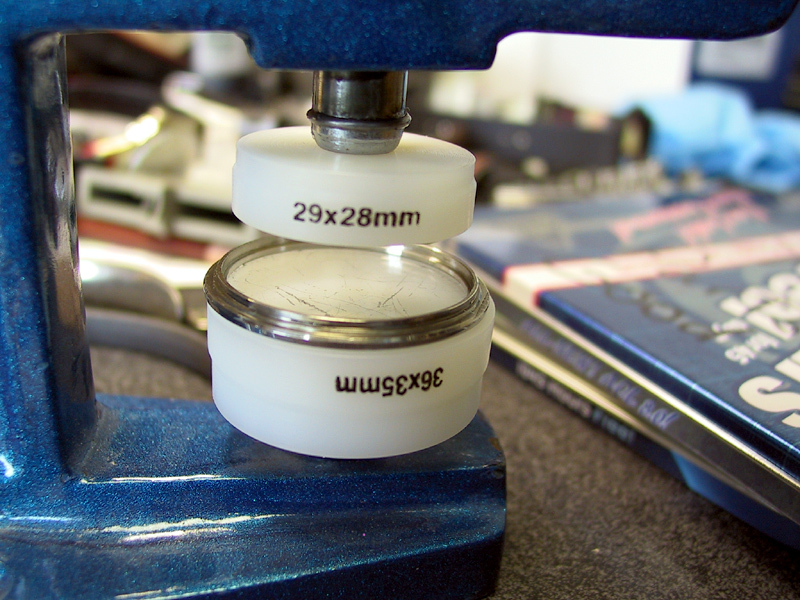 Choose a die for the bottom that will hold the case flat and choose a flat die for the top that is the same diameter or slightly smaller than the crystal and then press the crystal into the case untill its seated and has a uniform height around the edges. There is usually a lip on the watch case that won't let the crystal go in any further but once I press the crystal in I like to off center the case a little and work my way around the edge of the crystal with the press just to make sure its seated nicely all the way around. they wont pass for new old stock but they are wearable again! 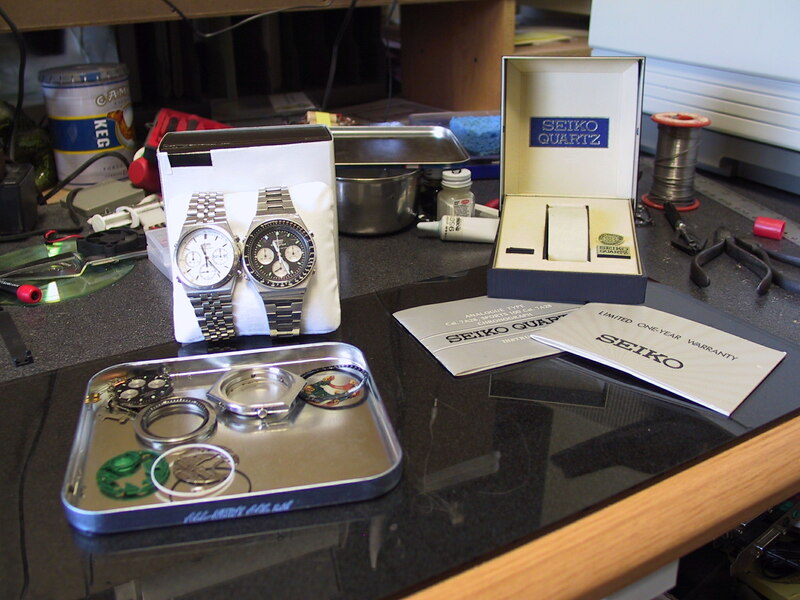 Conveniently missing from the photos above is the photo showing how I assembled the bezel to the watch, pressed the crystal in and then noticed the chapter ring still on the table. Its a good idea to take notes on what order things come apart or you will likely end up doing things twice! *Every watch movement has a small "catch" that holds the stem in the movement, Its not always easy to find or recognize. Asian models usually have a small dimple on the release where you press on it if its a press type . 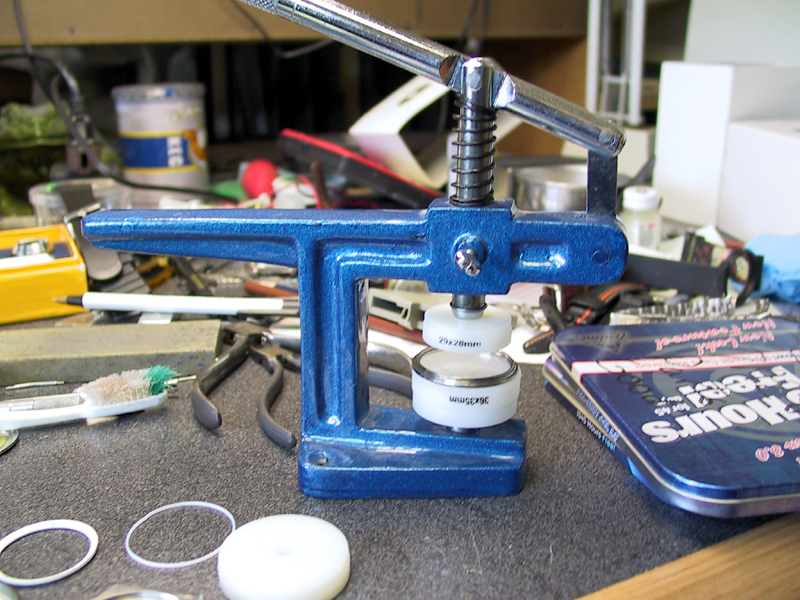 Swiss watches often use a screw or spring loaded pin type release that you push. Sometimes there is even an arrow with text that says "push here" it can't get any easier than that! Also worth noting Is that the release levers and pins are not always visible with the crown in the closed position, sometimes like in the case of the 7a"x"8 and similar movements like the one in this tutorial the release is only accessible in the hole when the crown is pulled out to the set position! Remember that if the new crystal is thicker than the old one it probably won't seat as far into the watch as the old one. Don't try to force it you will only break something. if the new crystal is thinner it will probably seat farther in than the old one. If you notice ahead of time that the new crystal is thinner you can pick a die that is larger than the crystal so that you only press it into the watch as far as the top of the bezel this will preserve the appearance of the watch! If its thicker you may have a problem if the crystal doesn't have beveled edges you will eventually chip the edges of the crystal or even break it. 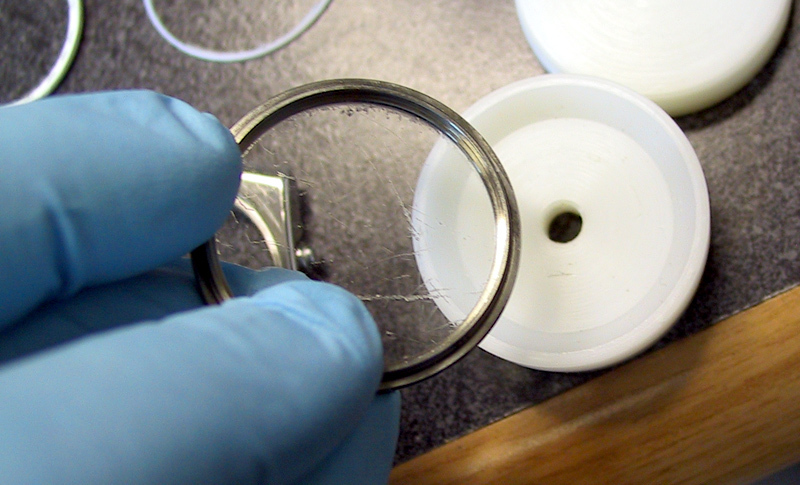 Sometimes you can replace a mineral glass crystal with sapphire glass crystal. With a little planning this is a good upgrade but you should be aware ahead of time that the sapphire is usually thinner because its much stronger (this is why we like sapphire it won't scratch either) and you may be committed to seating the crystal all the way in the watch case to hold a chapter ring in place. (you can experiment with spacers or taller chapter rings if you just happen to have some available) Its a good idea to always plan on replacing the crystal with an exact replacement just in case things don't work out! 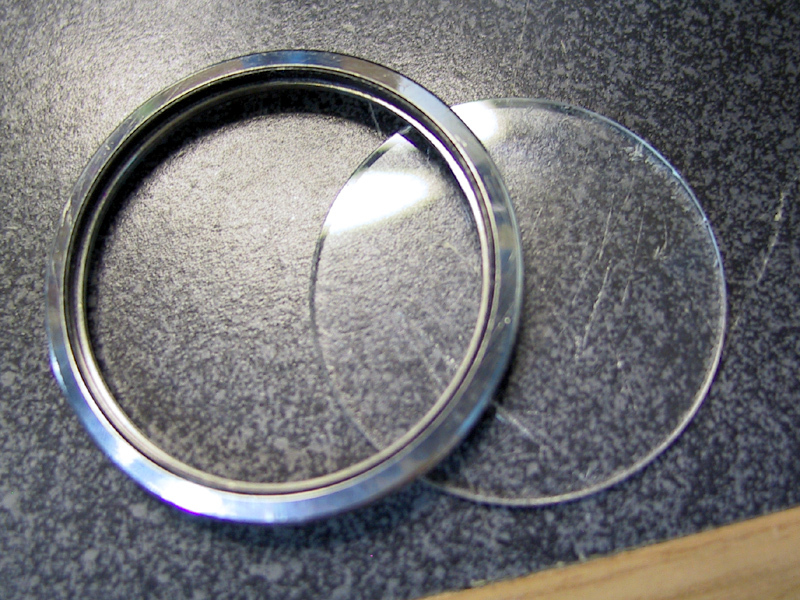 You can also often change from flat glass to domed glass or the reverse in some cases too. but again you should always plan on replacing the crystal with an exact replacement just in case things don't work out! 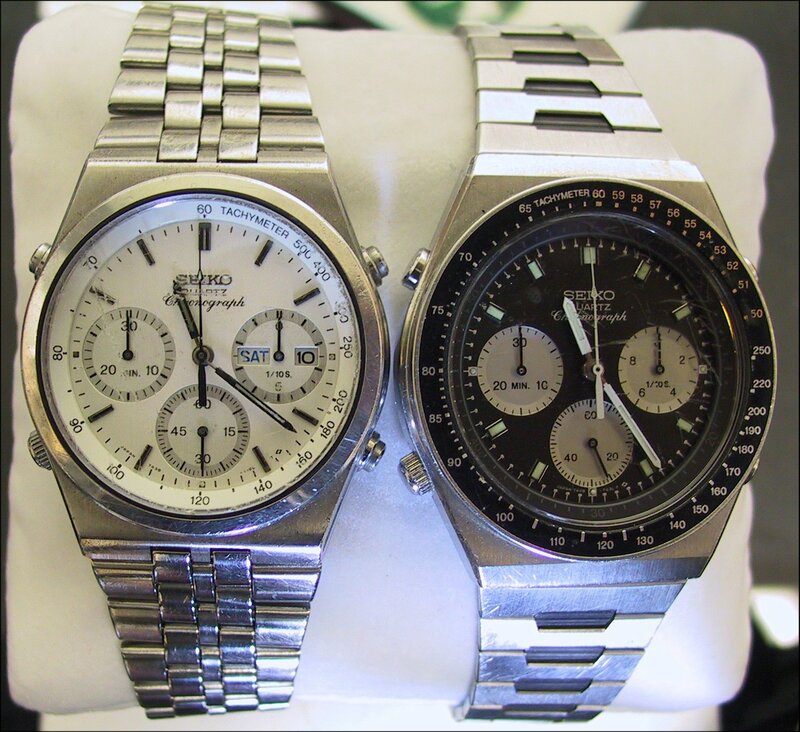 Not all watches with mineral glass crystals or sapphire crystals are pressed in! Cheaper watches or watches that are not designed to be water resistant at all often have the crystals "glued" in. You will likely need to glue the replacement in too although I have replaced glued in crystals with a press in gasketed type before.